Extreame Savings Item! 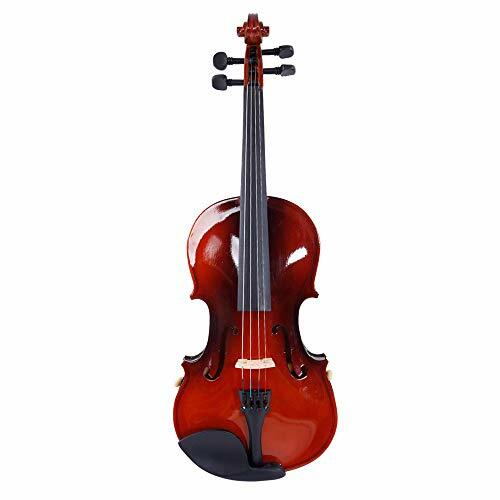 Save 47% on the Olymstore 1/8 Acoustic Violin for Beginners Children, Solid Wood Violin Kit with Carrying Case, Bow, Rosin, Shoulder Rest and Tuner, Natural Color by Olymstore at Bass Brass. Hurry! Limited time offer. Offer valid only while supplies last. Features: 1. New and high quality 2. All they are 1/8 size. 3. The top is made from wood 4. The head, back and sides of violin are made from wood 5. 2. All they are 1/8 size. 1/8 SIZE: The dimension of the violin is 31.3''L x 10.04''W x 4.72''H. Ideal for children who is 4 to 5 years old and have just begun their journey of violin learning. MATERIALS ADOPTED: The top, side and back of the violin are all made of maple, a widely-adopted material for manufacturing violin. And the chin rest, the tuning peg and the end pin are made of dark wood. CARRYING CASE INCLUDED: The dimension of the carrying case is 31.3''L x 10.04''W x 4.72''H, a great match with the violin. You can put it in the case and carry it with you when you go out. And the soft inside of the case can reduce tear and wear against the violin. ELEGANT APPEARANCE: The appearance of the violin is designed in a classic manner, fully presenting the elegance of violin. FULLY FURNISHED: The violin comes with carrying case, shoulder rest, tuner, bow and rosin. Most accessories are well prepared. If you are not sure about what accessories are needed for a beginner, this violin kit may be a nice choice for you. If you have any questions about this product by Olymstore, contact us by completing and submitting the form below. If you are looking for a specif part number, please include it with your message.